Huckleberry’s Natural Market Grocery Department is committed to offering a vast array of high quality natural and natural gourmet products. We give high priority to locally produced products and those regional and national suppliers who support the natural lifestyle. We also believe in building relationships with the companies who both produce natural products and support the industry through contributions to social and/or environmental causes. Extensive research has been conducted to bring together a complete line of minimally processed packaged groceries, free of artificial flavors, colors and preservatives. A major part of our mission statement is to help provide the most healthful food possible to our customers. Therefor we remain active in providing you everything you need whether you’re going Paleo, Grain Free, Dairy Free, Sugar Free, Vegan, Vegetarian or just trying to incorporate pieces of these lifestyle diets into your current regime, Hucks has you covered. We have lots of options to help you achieve your goals, just come in today and ask! A gluten free diet is another major dietary need that we can help folks cater to whether they’re intolerant or Celiac. We have gluten free options in every aisle of our store! And to help find them easier, we use these green tags you’ll find on the shelf below the product. Gourmet and Specialty grocery play an important role as a sub-group of our department. We provide an assortment of wonderful products from many ethnicities and gourmet channels. Some of our natural products have a higher standard of quality than others. Jacob has been with Huckleberry’s since 2011 and recently made the transition to the 9th Avenue Store. 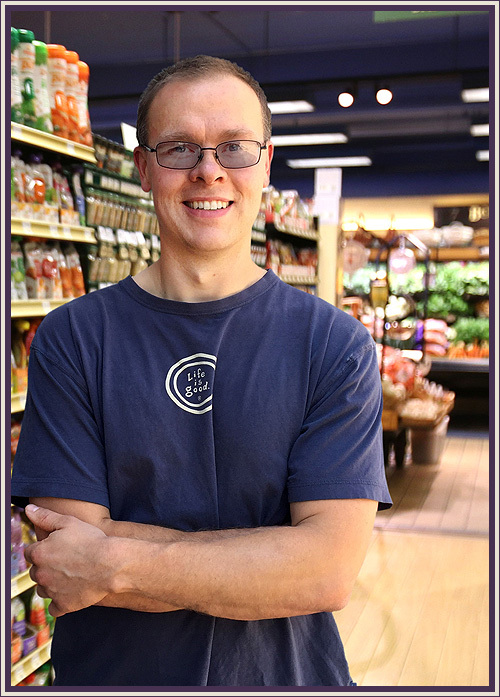 With a life long interest in healthy eating and cooking, he is committed to ensuring healthy, natural and delicious products are available for everyone. When he’s not at work he enjoys working in the garden and spending time with his family.